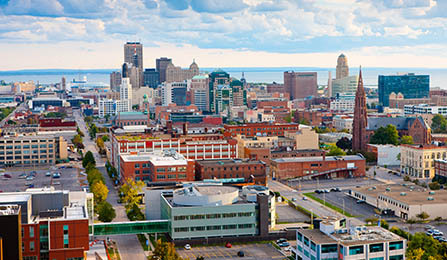 Our board members were instrumental in advancing the UB’s Downtown Campus, a key part of the ongoing resurgence in downtown Buffalo. The volunteers on our boards serve the UB Foundation–and, by extension, UB and our community as a whole. As part of our mission to support the university, we strive to gain insight and wisdom from these leaders in their respective fields, who provide local, national and global perspective in their service to UB. Our board members offer trusted advice and counsel, enabling the UB Foundation to provide UB with greater financial stability and enhanced flexibility. By leveraging key areas of expertise including investment, finance, real estate and gift stewardship, our committees build on the trusted experience of our volunteer committee members. Board members are chosen for their distinguished achievements, their professional expertise, and their commitment to advancing the University at Buffalo. Board members bring a wealth of expertise to the table, advising on stewardship of UB’s privately held assets, serving as ambassadors to the community, and helping us support UB in achieving university-wide goals.